Studied at Oberlin Conservatory, the Royal College of Music in London, and the Schola Cantorum in Basel, Switzerland. She has performed with the Academy of Ancient Music, the English Concert, London Classical Players, Les Musiciens du Louvre, Smithsonian Chamber Orchestra, the Washington Bach Consort, the National Cathedral Baroque Orchestra and the Bach Sinfonia, and with the chamber ensembles London Baroque, the Purcell Quartet, and REBEL. 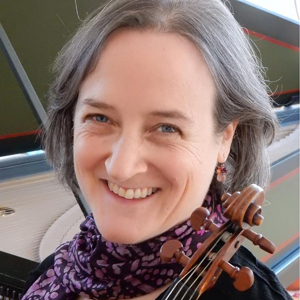 She co-directs Modern Musick, in residency at Georgetown University; is the orchestra director at H-B Woodlawn Secondary Program; is the co-director of the Baltimore Baroque Band. She plays a violin made by Jacob Stainer in 1641.